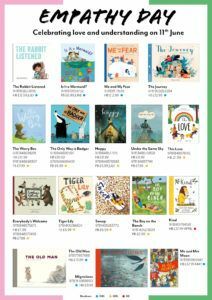 Empathy Day promotion – Bounce Sales & Marketing Ltd.
Be ready for Empathy Day on 11th June with these fabulous books from the Bounce list. Each book, in its own unique way teaches about understanding and caring for others and will help children learn concepts that will last them a lifetime. But remember, empathy is for life! Not just for Empathy Day. Download the flyer and contact your rep to make an order.